The drivers for the LED technologies allow changing the correlated colour temperature of white, usually in the range from 2700 K to over 6 500 K or warm to cool spectrum. This has many different uses: it can help increase productivity in the workplace, help the flow of customers in the retail environment or provide comfortable atmosphere in hotel lobbies. In the retail, residential and shopping applications the correct white tune can help drive the sales. The baked goods show the best under warm lighting, inviting a customer to buy them and suggesting freshness and positive mood. The jewels and precious metals, on the other hand, show the best in cold colour mix, underlining the shiny glitter of the metals such as silver and gold and showing the brilliant cut of gemstones used. Such lighting suggests luxury and high quality. With the introduction of LED technologies the designers got their hands on the possibility of setting the quality of the white light itself. While LED technology offers many opportunities to mix different colour shades from RGB elements, one should not overlook the often neglected fact that white is also a colour. The ability of intelligent drivers for the LED technologies allow changing the correlated colour temperature of white, usually in the range from 2700 K to over 6 500 K or warm to cool spectrum. This has many different uses: it can help increase productivity in the workplace, help the flow of customers in the retail environment or provide comfortable atmosphere in hotel lobbies. In the retail, residential and shopping applications the correct white tune can help drive the sales. The baked goods show the best under warm lighting, inviting a customer to buy them and suggesting freshness and positive mood. The jewels and precious metals, on the other hand, show the best in cold colour mix, underlining the shiny glitter of the metals such as silver and gold and showing the brilliant cut of gemstones used. Such lighting suggests luxury and high quality. All these effects can be dynamic: lobby lighting can be changed to business setting from a leisure one and retail outlets can vary the warmth of their white light according to the seasons. In workplace different settings of white can be used during lunch hour, providing a relaxing atmosphere, while working conditions might demand a different setting, one that e.g. correctly renders colours. This is especially important in spaces such as museums and galleries, where natural colour rendering is a priority. Extremely high-quality colour rendering under LED lighting of over 90 CRI (Colour Rendering Index, a way to compare quality of rendering under different light sources) is still difficult to achieve, but the newest LED technologies are tearing down even this barrier with CRI as high as 95. Other light sources should therefore be considered when extremely correct rendering is required, reducing the option to tune white to simple dimming – or changing the light source for a different one with desired qualities. For optimum performance technology must be employed that ensures consistency in the required white hue over time. The LED quality can deteriorate during its lifetime and colour sensors could help to detect such deterioration. 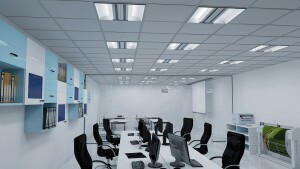 While replacing conventional light sources with LEDs can sound expensive – after all, replacing the standard halogen bulbs with LED equivalent is indeed a costly proposition – there are benefits to consider. First, to change the white colour does not require changing the light sources themselves, just tuning them as desired. As this change may cause increased sales or work performance, the investment pays itself off in increased revenues. The system has to be set up correctly, though, and closely monitored. In the case of upgrading the lighting system, a simple change of light sources is insufficient – the system has to be designed from scratch to fit the desired use and required illuminance levels. Larger installations with LEDs have to find a way to manage heat properly, making LED-only solutions more accessible to new environments rather than renovated ones. LED-only lighting can now closely emulate the natural visible spectrum with very high CRI. This is done by adding those parts of continuous spectrum which are missing, creating a deluxe version of standard white lighting.